Due in part to the micro- and nano-scale structures of the lotus leaf and the air trapped in between, only 2-3% of a raindrop actually contacts the leaf surface, and then rolls off. Image source: Wolf Friedmann. The lotus – a type of water lily native to Asia – has had its praises sung for thousands of years. In religious symbolism, Buddha often sits on a lotus leaf. Hindus view the lotus blossom as a symbol of divine beauty, associating the unfolding of the petals with the expansion of the soul. More recently, botany and nanotechnology have united to explore not only the beauty and cleanliness of the leaf, but also its lack of contamination and bacteria, despite its dwelling in dirty ponds. These images from a scanning electron microscope compare (a) an untreated lotus leaf, with micro- and nano-scale structures, with (b) an annealed lotus leaf, where the nano-hairs have been melted away. 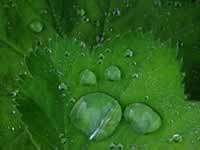 The annealed leaf restricts the rolling, self-cleaning ability of raindrops. Image source: Cheng, Y. T. et al. In recent years, scientists have developed theoretical models of the underlying mechanisms of the lotus leaf’s self-cleaning properties. Basically, the lotus leaf has two levels of structure affecting this behavior – micro-scale bumps and nano-scale hair-like structures – coupled with the leaf’s waxy chemical composition. However, research has not included a systematic, experimental investigation isolating structural and compositional effects, until now. The self-cleaning property of the lotus leaf – and applications derived from nature’s model – requires the surface to have roughness on two scales. When a raindrop falls on a lotus leaf, it forms a high contact angle (greater than 90 degrees), which means that it beads up rather than spreads out, as a liquid with a low contact angle (less than 90 degrees) would. A lotus leaf can have a contact angle close to 170 degrees, making it extremely hydrophobic. (For reference, human skin is slightly hydrophobic with about a 90-degree contact angle.) In fact, as little as 2-3% of the raindrop actually contacts the surface of a lotus leaf due to the waxy composition of the leaf, and to the air trapped between the raindrop and the leaf’s micro- and nano-structures. With such a small amount of contact between water and leaf, the raindrop rolls – rather than slides – down the leaf with little friction. The drop collects dirt and bacteria on its way, and in effect cleans itself. The Michigan team compared how the self-cleaning property would perform on a lotus leaf with both micro- and nano-structures or with only micro-structures to a lotus leaf. They also compared water drops on a piece of waxed cast smooth on glass. The scientists annealed (a process of heating and slow cooling) a sample of the leaves to melt the nano-scale hair structure while retaining the wax composition without chemical change. The team measured a significantly lower contact angle for the leaf with only micro-structures (126 degrees) and even lower for the smooth wax (74 degrees), compared with the contact angle of the two-structured leaf (142 degrees). This study marks the first time that the effect of the nano-hairs has been isolated from the microstructure and chemical composition of the leaf. The results verify the importance of the nano-structure on the lotus leaf’s self-cleaning ability – an essential understanding for inventors designing self-cleaning products in the future. Reference: Cheng, Y T, Rodak, D E, Wong, C A and Hayden C A. “Effects of micro- and nano-structures on the self-cleaning behaviour of lotus leaves.” Nanotechnology 17 (2006) 1359-1362.